Due to the popularity of our first and second restaurant copycat recipes eCookbooks, we are back with yet another restaurant recipe eCookbook! This 46-page book is chock-full of copycat recipes from your favorite chains. Nearly every one of us has had a meal at a restaurant that was so memorable, we wish we could recreate it at home. It is our hope that other home cooks can have the pleasure of cooking a copycat restaurant recipe in their own home and impress their family and friends with recipes that taste just like the real thing. 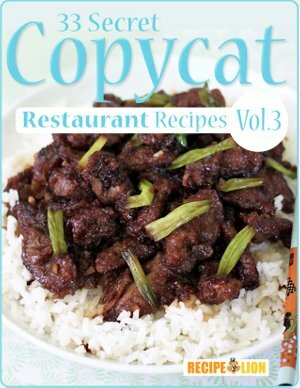 Get my free copy of 33 Top Secret Copycat Restaurant Recipes: Volume III! Nearly every one of us has gone to a restaurant and had a meal that was so good that we wanted to learn how to make that recipe at home. The problem is, famous restaurant recipes are tough to find because restaurants can be very protective of their most popular recipes. Luckily, many talented home cooks out there spend hours playing around in the kitchen to try and create copycat versions of those famous top secret recipes. And, while the copycat recipes may not be exact replicas of those famous restaurant recipes, they are so close that you will never know the difference. So, here at RecipeLion, we have put together our third collection of the best copycat recipes so that other home cooks could have the joy of cooking a top secret recipe in their own home. It is important to note that none of these copycat recipes are the actual copyright protected top secret recipes. Instead, they are copycat recipes that do their best to taste as close as possible to the famous recipes. Download your free copy of 33 Top Secret Copycat Restaurant Recipes: Volume III tonight! Copycat Applebee's Spinach Artichoke Dip (p. 7) - This version of spinach and artichoke dip is creamy and not overloaded with artichokes. This is a great appetizer for a party. If you're feeling ambitious, you could make homemade crostinis (recipe provided)! Olive Garden Breadsticks Knockoff (p. 8) - The breadsticks they serve at Olive Garden are unforgettable. This Olive Garden Breadsticks Knockoff recipe is your best bet for getting that same great taste right in your own kitchen. T.G.I. Friday’s Copycat Jack Daniel’s Sauce - (p. 16) - Try this favorite restaurant sauce on chicken, ribs, steak, shrimp or anything else you can think of. This thick and rich sauce is a definite crowd-pleaser. Benihana Ginger Salad Dressing Recipe (p. 17) - Get the creamy, spicy taste of Benihana's ginger salad dressing at home with this fantastic copycat recipe. This recipe is simple to make and uses basic ingredients that aren't hard to find. Chili's Black Bean Soup (p. 21) - This Chili's black bean soup recipe is so hearty it can be served as a main course. Tons of black beans are seasoned and cooked slowly with smoked sausage in this flavorful soup. Chili's Southwest Chicken Chili (p. 26) - Now you can make Chili's Southwest Chicken Chili at home! This recipe from the vice president of culinary operations at Chili's is a winner at the restaurant and it's sure to be a winner at home. Better than P.F. Chang’s Mongolian Beef (p. 28) - The much loved dish from P.F. Chang's just got even better because now you can make it at home any time you want! Just a few simple ingredients go into this Mongolian beef recipe, proving that you don't need a ton of fancy flavors to make an incredible Chinese meal. Carrabba's Copycat Chicken Marsala (p. 32) - Make a delicious restaurant-style chicken at home with this quick and easy copycat recipe that tastes just like the chicken marsala at Carrabba's Italian Grill. This recipe serves one, but you can multiply the ingredients to make this for the whole family. Red Lobster Shrimp Scampi (p. 31) - Shrimp scampi is such an easy dish to make, and Red Lobster Shrimp Scampi is among the best. Use this easy copycat recipe to make your own home version of their mouthwatering dish and your family will be in seventh heaven! Carrabba's Italian Grill Copycat Meatballs (p. 38) - This restaurant copycat recipe uses a combination of three meats: ground pork, ground veal, ground beef - the same meat combination used for meatloaf. This unbeatable combination of flavor will make you happy that you decided to stay in and cook. Chili's Copycat Chocolate Chip Paradise Pie (p. 43) - If you've ever had this decadent dessert from Chili's, then you know it's simply heaven on a plate. The whole thing practically melts in your mouth. It really is paradise in dessert form. Carrabba's Chocolate Dream Copycat Recipe (p. 44) - Make a restaurant-quality dessert in your own home with this decadent Carrabba's Italian Grill copycat dessert recipe. Take some shortcuts and use boxed brownie mix and mousse mix and have an impressive dessert together in minutes. If you enjoyed this eCookbook, be sure not to miss Volume I and Volume II of RecipeLion's restaurant recipe eCookbooks. You can easily download and print out each eCookbook for easy reference while cooking. For help downloading our eCookbooks, see our help document here. If you enjoyed this free eCookbook, you won't want to miss any of our other downloadable recipe collections. You can browse our entire library of free eCookbooks here. How do you download the free e-cookbook to a usb drive instead of the computer you are using to download? br br Can you get more than one free or do you only get the first one free when you open up your account? Thanks. You can get them by clicking the "to view and download the complete collection of RecipeLion eCookbooks" link at the end of this page, just above the comments. How can I get Vol 1 Vol 2 of the Copy Cat recipes?